Welcome to Silverstein & Vinciguerra, LLP – where your smile is our top priority. As a leading oral health provider in the New Hyde Park area, we are committed to providing the latest in dental care for you and your loved ones – always with a gentle touch, and always personalized to your specific needs. An important part of our commitment to patient health and satisfaction is our comprehensive dental consultations. These meetings enable you, the patient, to make more informed and comfortable decisions regarding your own dental health. And, by learning how to properly care for your teeth and gums, you’ll find that your dental health is easy to manage. Our caring staff of five dentists and multiple technicians will deliver leading edge dental care. We believe in creating lifelong connections with our patients, and feel that a beautiful smile and healthy teeth and gums are a vital part of your overall well-being. From x-rays and dental cleanings, to root canals, restorative procedures, or even emergency dental interventions, we can help you to discover the smile that you’ve always wanted, and our services are tailored to those of all ages! We believe that all patients deserve a beautiful smile and healthy teeth and gums, so we currently accept a wide range of payment options and work with several insurance providers to make your experience as painless as possible. For more information about Silverstein & Vinciguerra, contact us today at 516-354-1768, or complete the Contact Us form on this page to ask questions or leave comments. You can also schedule with ease by clicking on the Request Appointment button on this page. 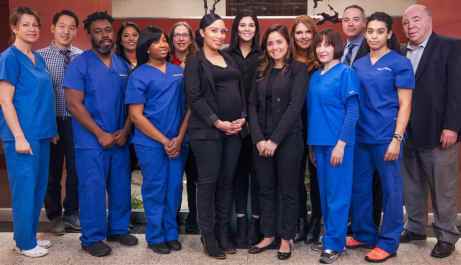 We are excited to help you find your smile, and our compassionate and caring team of dental professionals are ready to exceed your expectations. Schedule an appointment today! Dr. Michael Vinciguerra, DDS has been recognized as one of the top New Hyde Park Dentistry practices.